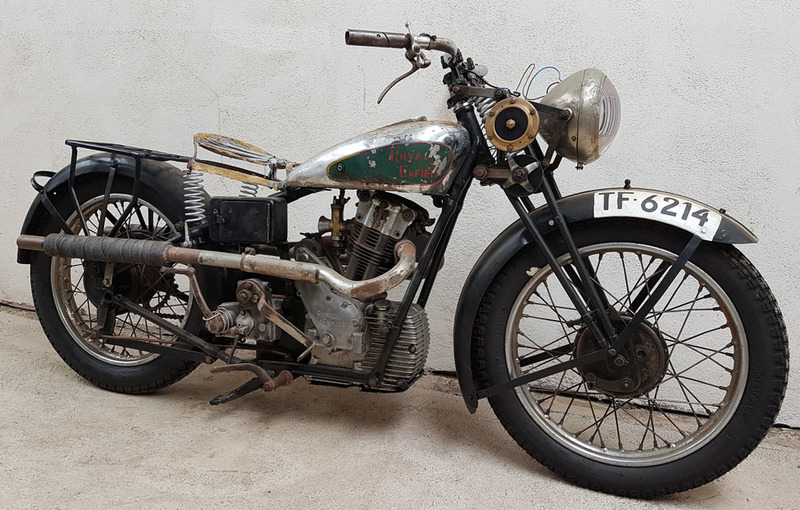 Could a Royal Enfield motorcycle look more dashing than this 1934 Bullet? The rare Royal Enfield pictured here belongs to Frank Martens, of La Palma, one of Spain's Canary islands, off the northwest coast of Africa. It's a "sloper" (with its cylinder canted forward to enhance the look of speed). The big finned oil tank ahead of the cylinder looks incredibly racy. The dual exhausts (on a single cylinder) are extra showy. 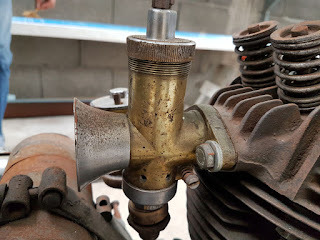 Also rare, in Royal Enfield history, is its four-valve head, a production feature only in the 1930s. The valve gear is exposed. "The bike is a 1934 Model LFL (meaning an LF with lights) four-valve, 488cc machine that was dispatched from Redditch on the 13th December, 1933 destined for Real of Tenerife." Tenerife is the largest of the Canary Islands. Is headlight that big or is the motorcycle that small? Graham added that the factory ledger mentioned "Electric Horn," probably a nice feature in those days. He attached a 1934 catalog illustration showing what the motorcycle would have looked like new. Today this Royal Enfield displays eight decades of well earned patina. While "fully complete," it doesn't start, Frank wrote. 1934 Royal Enfield Model LF carried the "500 Bullet" name. "I am a German, living on La Palma, a very little island of the Canary Islands," he explained. "The people here told me that a citizen of the island ordered the bike in the year 1933. Then it spent about 70 years on the street, but only on our island. I cannot prove this, but this story was told by older people. "Then it broke one of the tappets and the bike was sold to a German doctor who begins to rebuild the bike. With the help of a lathe shop they finished a new tappet, mounted new tires, and replaced the primary and secondary drive. 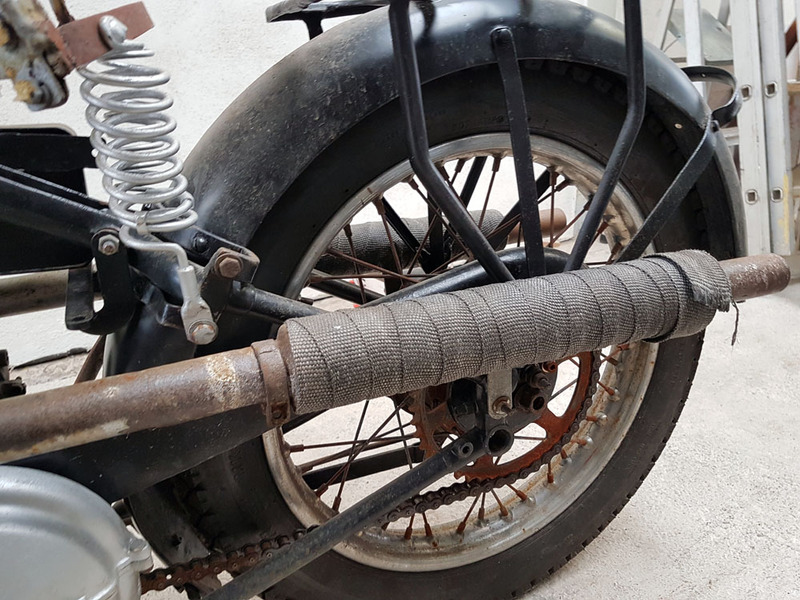 "The new tappet was not installed, so the bike didn't start. Then the doctor lost interest and forgot the bike for 10 years in a garage with a lot of other bikes. Brass carburetor. Note the exposed valves to right. 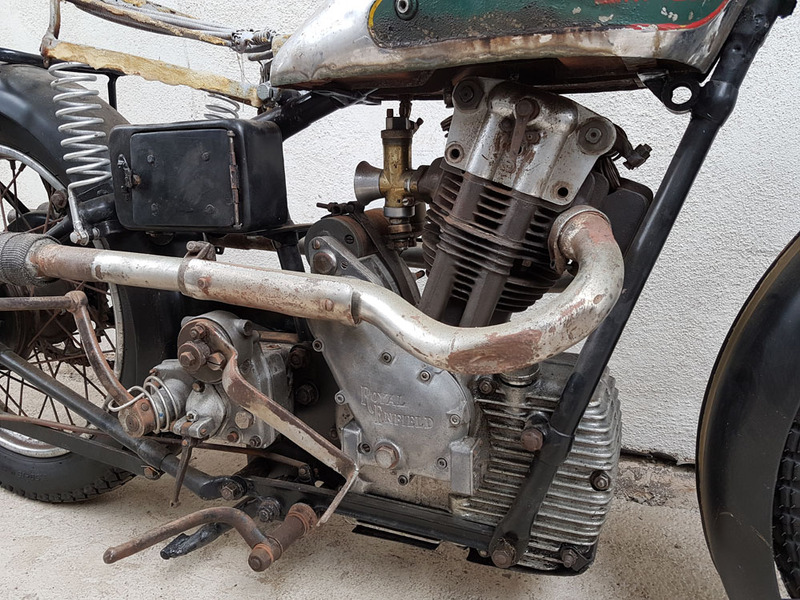 "In the last week I came there to look for a 45-year-old Harley that I wanted to buy and rebuild. When I saw the Bullet I was fascinated and bought the two bikes in a package. "At the moment, I don't know how I will proceed. Is it better to leave all in this state (original) or is it better to paint and rebuild it? I don't know. "Maybe I will sell it to people who have better possibilities to restore it perfectly." Sloper motor and finned crankcase attract the eye. 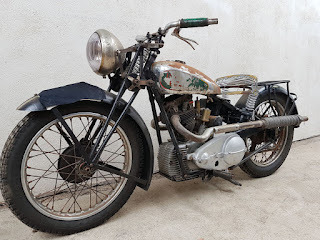 According to blogger Jorge Pullin, 1933 was the first year for the Royal Enfield Bullet. They were intended to bring excitement to the model line-up. The dashing "sloper" motors were replaced by upright cylinders in 1936 and Royal Enfield returned to two-valve heads as standard for 1938. ...but those twin exhausts must have sold some bikes, too. All of which makes this rare Royal Enfield exciting to see.